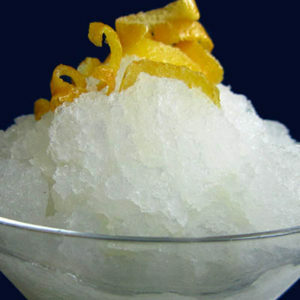 If you can remember the number two, you can make intense, delicious lemon ice. Two cups of strained lemon juice, two cups of water, two cups of sugar. That’s it! Combine the water and lemon juice in a small saucepan. Add the sugar. Bring it to a boil on medium heat, stirring constantly. Let it cool to room temperature. Pour the mixture into an 8-inch cake pan and put it in the freezer. In three to six hours you’ll have terrific homemade lemon ice.